DESCRIPTION FROM THE PUBLISHER: “What do you do with a problem? Especially one that follows you around and doesn’t seem to be going away? Do you worry about it? Ignore it? Do you run and hide from it? This is the story of a persistent problem and the child who isn’t so sure what to make of it. The longer the problem is avoided, the bigger it seems to get. But when the child finally musters up the courage to face it, the problem turns out to be something quite different than it appeared. This is a story for anyone, at any age, who has ever had a problem that they wished would go away. It’s a story to inspire you to look closely at that problem and to find out why it’s here. Because you might discover something amazing about your problem]] and yourself. 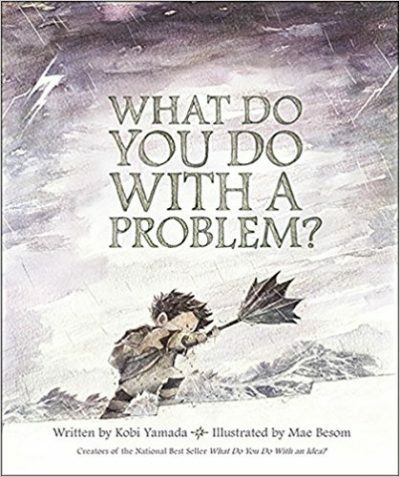 What are problems for? They challenge us, shape us, push us, and help us to discover just how strong and brave and capable we really are. Even though we don’t always want them, problems have a way of bringing unexpected gifts. So, what will you do with your problem?